Ambrose Brazelton received his B.S. Degree at the University of Akron in 1952, his Master’s Degree at Kent State University in 1960. He was the recipient of the Valley Forge Freedom Foundation Teacher Award in 1963. He is a member of AAHPER, OAHPER, Midwest AHPER, Ohio State Education Association, National Education Association, and the Society of State Directors of Health, Physical Education & Recreation. Brazelton (1924-2010) once traveled extensively throughout Ohio and the nation as a consultant lecturer and demonstrator. He proved again and again his ability to make children enjoy and participate in physical education programs. 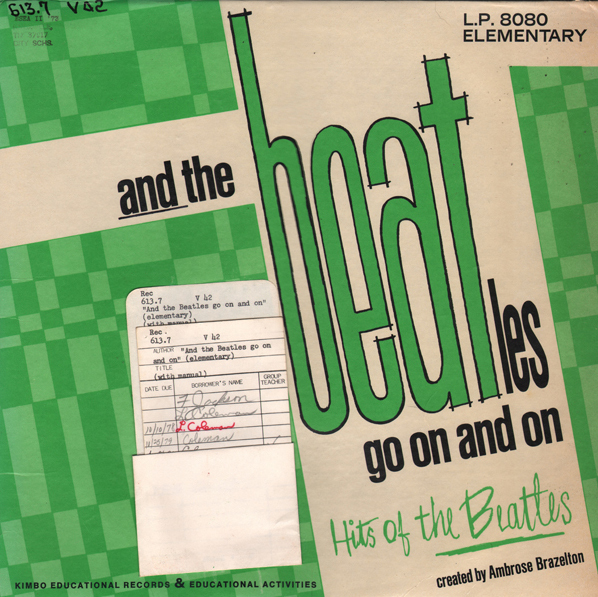 On the back cover, just below the list of song titles, it states “Music and lyrics, Lennon & McCartney” – even though George Harrison’s #1 Beatle single, “Something” is on the album!